I can hardly believe it’s almost the 4th of July already!!! Time is whizzing by so fast that I can quite wrap my head around it! Summer in Illinois has been odd, at best. Last year we experienced an entire summer of 90+ degrees and almost no rain to speak of. This summer we’ve only had a handful of 90 degree days and the rain keeps on a comin’. I think today we’re not even expected to reach 70 with more rain expected! Sheesh! Like I said….odd, indeed. One thing’s for certain however, no matter the weather, summer is all about grilling and BBQ’s so it’s only fitting that today’s #SundaySupper theme (hosted by Jennie of The Messy Baker) has us all firing up the grill!!! Thanks for hosting Jennie and, great choice!!! My recipe is one that I’ve made a few times this season already (the photos show are actually from the two different times I’ve made these this summer), and it takes advantage of all those cute little colorful potatoes (red, white and purple) that I’ve been finding at the grocery store lately. It also makes use of all those wonderfully, plump, sweet and colorful bell peppers. 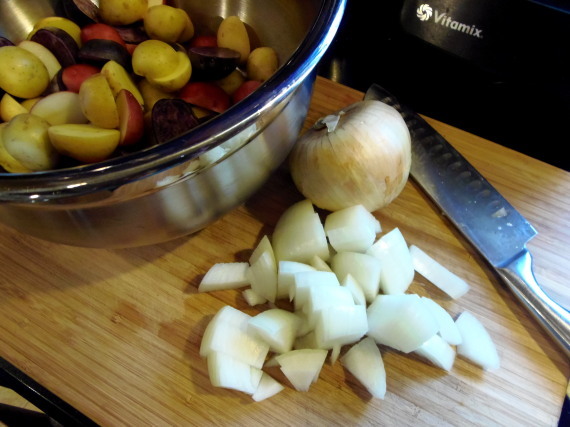 Not to mention my all time favorite aromatics…onions and garlic! Have fun playing with the colors and ingredients with this one. As far as I’m concerned…the more colorful, the better!!! 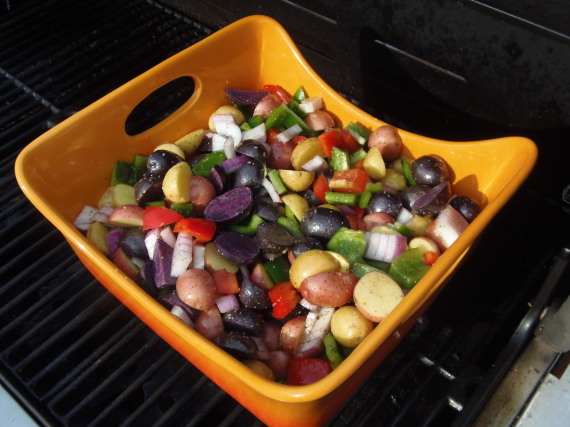 When making this grilled side dish, make sure you allow these potatoes enough time on the grill to cook through thoroughly. You may even need to start them before anything else you may be serving (depending on what your menu is) so plan on at least 45 minutes, or until the potatoes are fork tender. An unusual thing about this recipe is that is also utilizes the grill as an outdoor oven. 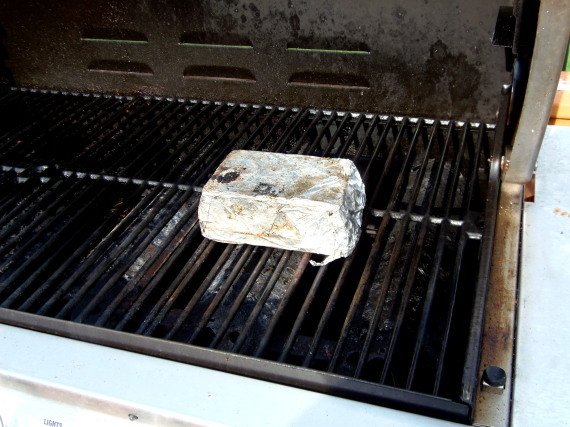 The way I do this is by placing a tin foil covered brick on the grates of the grill and then placing the casserole dish of potatoes on top of the brick, not directly on the grill grates. Doing this insures that the cooking of the potatoes are done more like in an oven with indirect heat and that the potatoes won’t char and burn as they would if placed directly on the grill grate. Works like a charm!!! 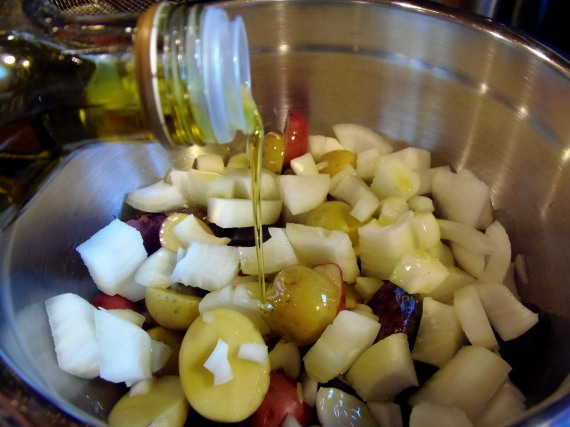 -Place all the ingredients into a large bowl (no specific order necessary) and mix well to combine and coat all the ingredients with the oil. 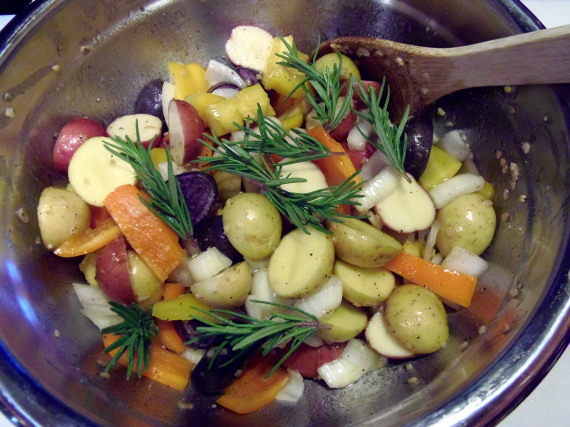 -Place the potato mixture into a large casserole dish. -Place the casserole dish on top of the foil covered brick and close the lid of the grill. -Cook over medium/high heat for approximately 45 minutes or until fork tender, stirring occasionally. -Remove from the grill and cover with foil until ready to serve. 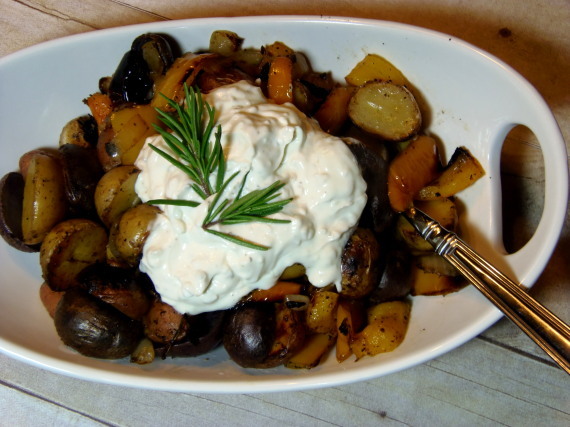 -Garnish with sour cream or French onion dip is desired and an additional sprig of rosemary. Enjoy your summer everybody! Now, go get your grill on!!! For other great grilling and BBQ recipes from #SundaySupper members like me, click on the links below and grab a napkin (you’re going to be drooling)! Nothing better with potatoes then peppers and onions! I love it! I love your trick for grilling these! I'm definitely going to use that! I had never thought about making vegetalbes like that, sounds really good! Oh my goodness, I LOVE the purple potatoes!! I grill potatoes with shallots and thyme all the time, but I'm going to have to shake it up and try onions, peppers and rosemary. And I LOVE the brick hint…thank you!!! Can't go wrong with potatoes, peppers, and onions. Yum. Yummm! And how have I never thought to top potatoes with french onion dip?! Yum! Love all the flavor you pack into your potatoes. Those look awesome! Now, I have to try french onion dip on them. Never thought of that and I love the idea! 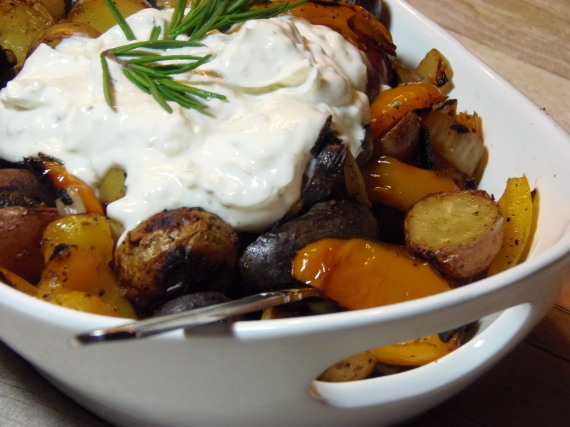 Love roasted potatoes and these look so colorful and yummy!Love the rosemary and the french onion dip sounds great on top! Beautiful dish! 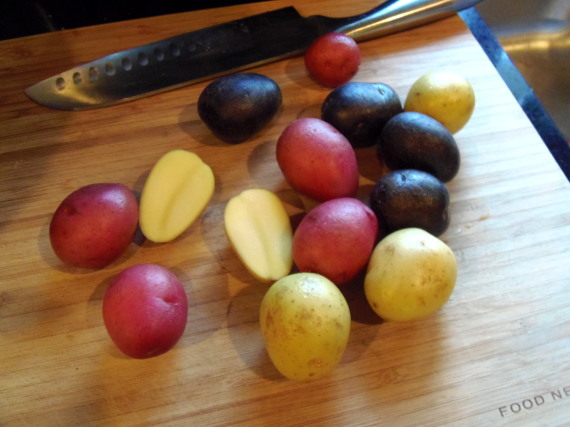 How fun to have lots of multicoloured potatoes! 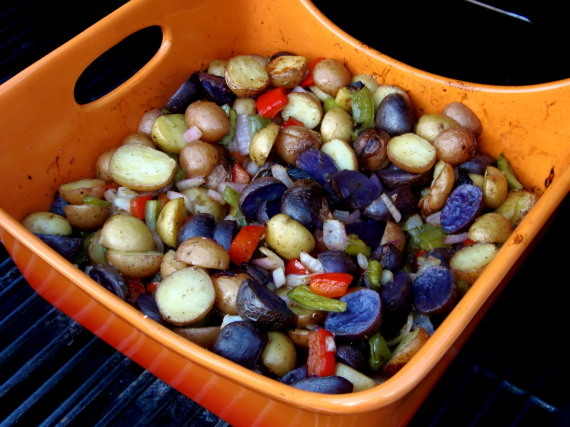 Potatoes, onions, and peppers are one of my favorite food combos and they are even better cooked on a grill. Thank you so much, Renee! I love this recipe. 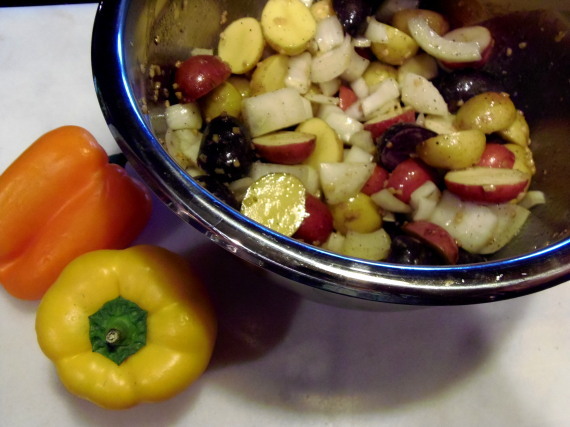 Anything that combines potatoes with peppers and onions is my kind of recipe. Mmm, I could eat this as a meal. 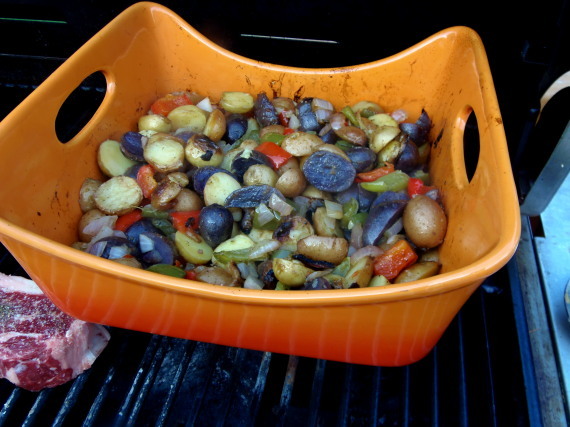 Wow – these potatoes and peppers sound spectacular! 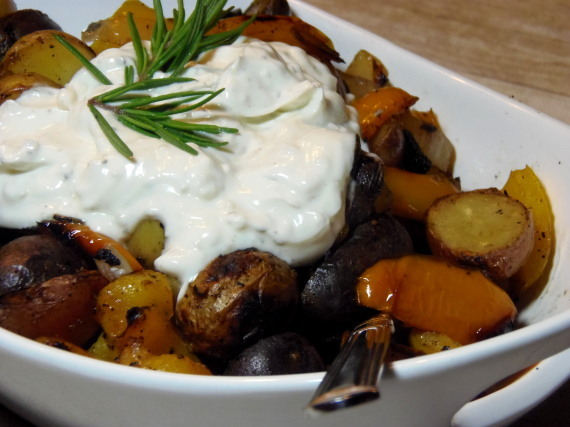 Potatoes and peppers are always such a great combo! This looks delicious. I never thought of adding French onion dip on top instead of sour cream. Sounds so good! Yes, these do look delicious and I know the aroma of them while being grilled must be amazing. Great recipe Renee. Like you, we are still grilling throughout this wetter and cooler Spring and Summer. Ooooh I know what I'm having for dinner tonight! I so love grilled vegetables. Those multi-colored baby potatoes are great! I hope I can find them at my store.